Tarkwa, 2 April, 2019 – Staying good to its word, AngloGold Ashanti (Iduapriem) Limited which operates the Iduapriem Mine has offered more than 100 jobs to people in host communities since the beginning of the year following the implementation of its Community Employment Procedure. Highlighting the drive to hire members of the host communities at Iduapriem’s annual Thanksgiving Service, Mr Jasper Musadaidzwa, the Managing Director of the operation, said it had already hired 116 people as part of its Community Employment Procedure. AngloGold Ashanti recognises how important jobs are to the community and has been working with the Community Employment Committee to coordinate and ensure fairness and transparency in community employment processes. To-date, 90 percent of those employed are in the unskilled job category; 112 are men and 4 women. Speaking at the 17th Annual Non-Denominational Thanksgiving Service, Mr. Musadaidzwa, said Iduapriem was working collaboratively with stakeholders and business partners to address both the gender and skills gaps that has been identified in employment in the host communities. He reported that the Mine, in collaboration with the Department of Agriculture of the Tarkwa Nsuaem Municipal Assembly, had also piloted a Vegetable Cooperative and Piggery Project last year in support of the Government of Ghana’s Planting for Food and Jobs initiative. These initiatives have provided economic opportunities for about 30 households in host communities and work is underway to expand the projects. Mr Sulemanu Koney, the Chief Executive Officer of the Ghana Chamber of Mines, commended AngloGold Ashanti for being a trusted partner and significant contributor to the advancement of the mining industry in Ghana. He was hopeful that the Iduapriem Mine will continue to chalk up several other successes and help the industry to grow. “I urge you to continue introducing innovative programmes and social interventions to make your host communities much better off than when AngloGold Ashanti met them,” Mr Koney said. 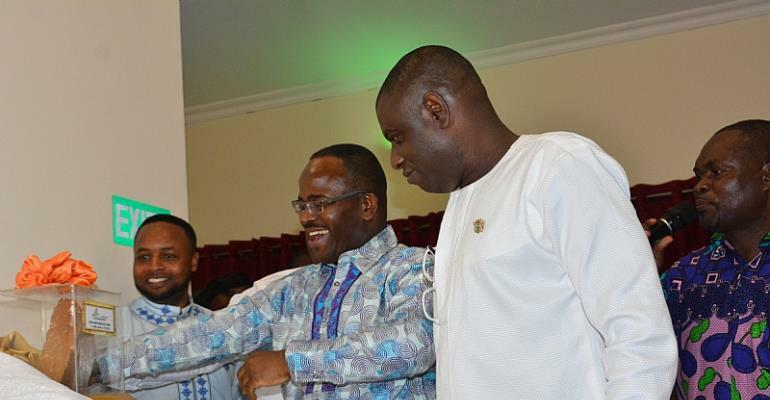 The celebration was attended by several high-profile personalities, including the Member of Parliament and Municipal Chief Executive for Tarkwa Nsuaem, representative of the Western Regional Minister, the Chief Executive Officer of the Ghana Chamber of Mines, the clergy, traditional authorities, among other distinguished personalities. The service was on the theme “…make known among the nations what He has done” (Isaiah 12:4 NIV), with Apostle John Appiah Aidoo, Area Head, of the Church of Pentecost, Tarkwa, delivering the sermon. The occasion was also used to launch the 15-year anniversary celebration of AngloGold Ashanti Limited’s merger with Ashanti Goldfields Limited. AngloGold Ashanti, an international gold mining company with a globally diverse, high-quality portfolio of operations and projects, is headquartered in Johannesburg, South Africa. Measured by production, AngloGold Ashanti is the third-largest gold mining company in the world. AngloGold Ashanti produced 3.8Moz of gold in 2017, generating $4.36bn in gold income, utilising $830m capital expenditure. AngloGold Ashanti has an attributable Ore Reserve of 49.5Moz of gold and an attributable Mineral Resource of 208.2Moz.